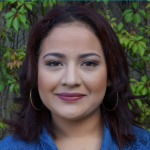 Silvia is originally from Iztapa, Escuintla and was selected as a GOJoven Fellow when she was 22 years old. She has a degree in Pedagogy and Human Rights and is a teacher in primary, basic and diversified education in Sexual Rights and Reproductive Rights. Silvia has experience working with colleagues from the university, in the local community, and with the implementation of the action plan. Her best experience was with the GOJoven and EIS training on the theme of sexual and reproductive health and rights. She wants to support the GOJoven team in the struggle to defend sexual rights, and her goal is to support adolescents in the community to prevent pregnancies and human trafficking.